GAITHERSBURG, Md. - A Montgomery County community is mourning the loss of teen Tyler Terry. 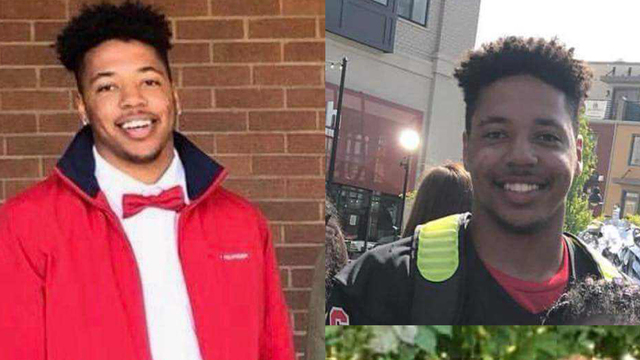 The student and football player from Quince Orchard High School died Sunday after being hospitalized for almost two weeks for a heart condition. Terry family friend Jennifer Springer wrote on a GoFundMe page for the teen that Tyler's heart went into an arrhythmia and stopped on Jan. 29. He was taken to Shady Grove Hospital and then was flown to Children's National, where he remained in Intensive Care. On Sunday, Springer posted an update from Tyler's sister: "My Whole world turned upside down today....one of my heartstrings received his angel wings, walking through the gates of heaven." Tyler was a linebacker for Quince Orchard and had committed to playing at Monmouth University in the fall. Quince Orchard Athletics posted on Twitter: "Thoughts and prayers to everyone in the QO community especially Tyler’s teammates, coaches, friends and family. We love you Tyler and you will forever be in our hearts." Montgomery County Public Schools Athletic Director Jeff Sullivan also wrote "Our deepest condolences to Tyler’s family, friends, coaches, teammates, and the entire QO community. Our thoughts and prayers are with you." Quince Orchard Football also released a statement on Twitter saying "Our deepest sympathies to Tyler's family. Nothing can prepare you for the loss of a loved one and the grief that comes with it. It's completely impossible to put it into words. Tyler was a son, brother, cousin, teammate and friend. In 17 years of life it's easy to see how many people Tyler had a positive effect on. The outpouring of support shown by everyone is amazing. That is a testament to how he lived his life, with a big smile on his face and making someone laugh. We will celebrate the 17 years he was on this earth and never forget the special time we got to spend with him. We will strive to accomplish everything he will not be able to, all while doing it for him. We love you buddy. #6strong #doyourjob #family"